I like to go walking--sometimes for hours at a time. It takes a bit longer than jogging but there's something about it that makes me prefer it. Perhaps it's the little details I catch along the way, or the opportunity to stop and smell the roses. I've never been much for moving fast. I always took the moral of the Tortoise and the Hare to heart: slow and steady wins the race. So, I give myself a bit of extra time and I walk, leisurely. Normally, I walk to work, but in the summer time, all I do is walk around and explore my surroundings. Walks become more difficult in autumn and winter, when the days are shorter, but I usually get one or two in on my days off. I don't like to walk after dark quite as much, mostly because it's harder to see your surroundings and pick out those neat little details that you could see more easily in the daytime. Occasionally, though, something special will happen during a nighttime walk. One time, I saw a friendly cat with a scratchy voice, running toward me on only three legs. She let me pat her for a moment, but then I heard a door across the road open, and a woman calling softly to her. I don't remember the name, but it was a cute, feminine name, like Amelia, or Annabelle. The cat went running back across the street and I thought to myself that she was probably well-loved and well-taken care of. While on my walks, I have a number of notebooks that I keep close at hand in case of sudden, inexplicable inspiration. This happens fairly often. One of these books is a little brown Moleskine that I use to write poetry. It's a bit faded now, but it features a design that I put on to decorate it. Inside is poetry that I've been writing since 2010. My father gave it to me one day when we were on a little excursion together in Sackville. He bought a little three-pack and handed one to me for use on my travels, and I've been using it ever since. It's an interesting assortment of poems, because they were written during various periods of self-evolution. One of them, for example, was inspired by how excited I was to try and find a new job. One was written when I really didn't want to go to work. I wrote one while visiting a graveyard in the town of Charlbury, England, based on the idea of walking with the dead. I have a page dedicated to haiku. All of these poems I can look back on and associate with a time in my life. 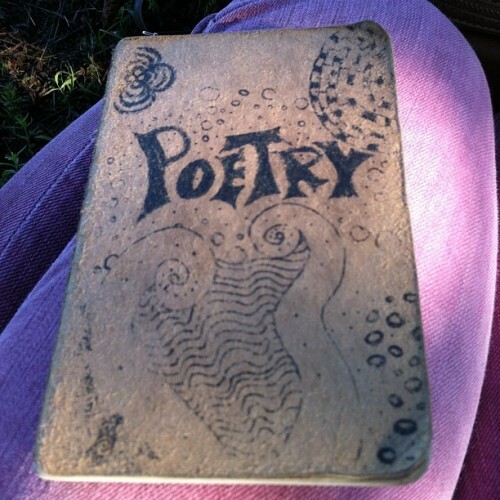 I will, now, share with you the final poem I wrote in this little book. I wrote it yesterday, pausing on my walk to work. It needs editing, but perhaps publishing this unfinished version of it will force me to finish it! It is currently without a title. That we end up becoming defined by it? And the media spewing pollution of a whole different kind. What to think of the woman who walked by alone, having an animated discussion with herself? When I can't stop thinking about how stupid she looks in that outfit? Society has trained us all to be mindless and shallow. The defining moment comes when we are able to break free of those restrictions. I wouldn't call it a positive poem by any stretch, but more of a "catching myself in the act" poem. Have you ever caught yourself thinking something about a certain topic that, under normal circumstances, you would be embarrassed of yourself? That is, essentially, what this poem is about. On more than one occasion of late, I have caught myself doing just that and feeling ashamed of myself. Instead of beating myself up over it, I turned it into something creative. And, here we are. It's a little reminder to go back to former ways of thinking while I still know that the current way of thinking, really, is not who I am at all! Tomorrow, I will go out and find a new little pocket book for poetry, and begin another chapter in my everyday-inspired poetry. Awesome poem. You have such wisdom Katie.